Taller Arte del Nuevo Amanecer would like to invite you to our Spring Open House & Graduation Exhibition on June 8 at 4 p.m.
Our Spring Open House, will feature the works conducted in our Spring 2013 Silkscreen Workshop. We invite participants and community members to bring their families and friends to view and celebrate the artwork created by our workshop participants. We also encourage community members interested in learning more about TANA to join us for this event, as this is a great way to learn more about the work that we do. 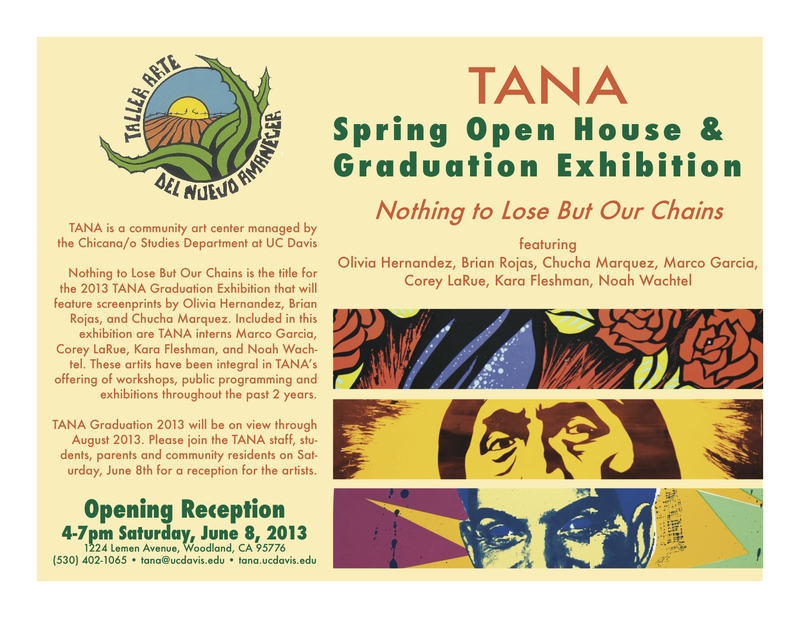 The TANA Graduation Show, Nothing to Lose But Our Chains, will feature silkscreen prints by TANA workshop workers Olivia Hernandez, Brian Rojas, and Chucha Marquez. The show will also include works from TANA interns Marco Garcia, Corey LaRue, Kara Fleshman, and Noah Wachtel. All of these artists have been an influential and integral part of the work done at TANA. These workers have played a vital role in the workshops and events offered at TANA throughout these past two years. We invite you to come honor and celebrate their hard work with us on June 8th.